Get our Official App for notifications and more! Thanks to the following list of awesome donations and of course thanks to all of our awesome volunteers! Childs Pace Early Learning Centre Ltd.
Congratulations to Aiden Mabie who moved up to 9 Expert Male! Congratulations to Trystin Minor who moved up to 10 Intermediate Male! Congratulations to Ethan Kitt who moved up to 11 Expert Male! Congratulations to Bryson Vanderveen who moved up to 8 Intermediate Male! Congratulations to Benjamin Scholten who moved up to 9 Intermediate Male and Erin Richter who moved up to 25+ Expert Female! Can't ride a 2 wheeler yet? Big brother or sister racing? You want to race too? Well in 2018 we are going to have a strider race at EVERY district race! Returning members please be sure you have your license before coming to the track. If you have ridden on a waiver in the past you cannot use a waiver again. We do not want to have to turn anybody away on the first weekend due to no license. We are located Northwest of the Dave Elton Ball Complex and North of the Chinese Cemetery. If you turn west on 6th Ave. North from Stafford Drive North and turn North just before the cemetery you have found us. Our season typically begins the first weekend of May and ends the final weekend of September. Inclement weather will force cancellations so watch our Calendar , our Facebook Page or our Twitter account for updates throughout the year. To move up from Novice to Intermediate for all BOY'S classes you need 10 first place finishes as a Novice in your BMX career. A first place finish is an overall finish for that particular race night/day and not simply just one race. If you have been racing for 4 years and finally got your 10th first place finish as a Novice, you will be responsible to move up to the Intermediate. To move up from Intermediate to Expert for all BOY'S classes you need 20 first place finishes as an Intermediate in your BMX career. A first place finish is an overall finish for that particular race night/day and not simply just one race. If you have been racing for 4 years and finally got your 20th first place finish as an Intermediate, you will be responsible to move up to the Expert. To move up from Novice to Expert for all GIRL'S classes you need 25 first place finishes as a Novice in your BMX career. A first place finish is an overall finish for that particular race night/day and not simply just one race. If you have been racing for 4 years and finally got your 25th first place finish as a Novice, you will be responsible to move up to the Expert. There is no Intermediate class for Girls. In Alberta we follow the UCI (worldwide) BMX Rulebook with country and province specific ammendments. 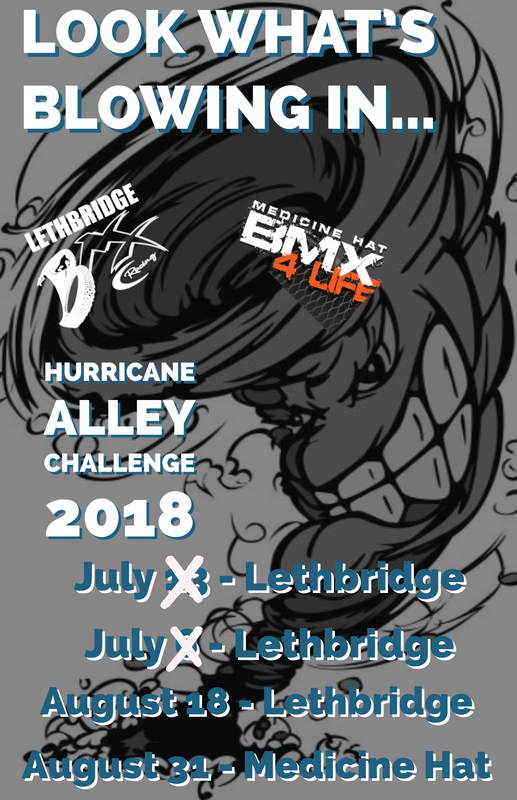 We first refer to the Alberta policy, any rules not listed there would refer up to the Canadian Cycling Guide and in the same manner, then up to the full UCI BMX rulebook. 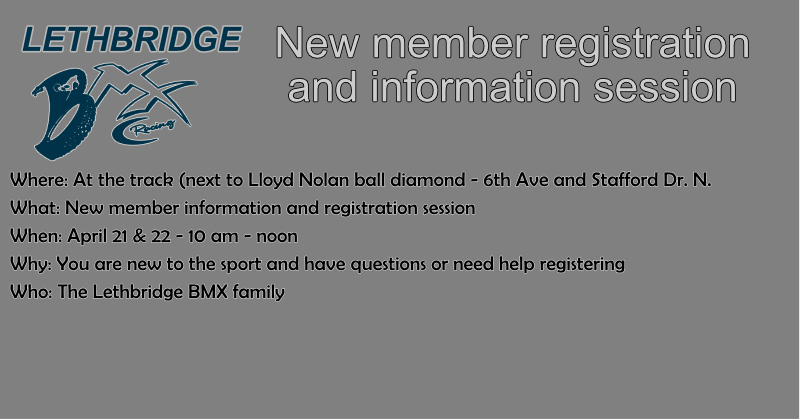 Lethbridge BMX is a bicycle motocross racing club that has a membership consisting of both male and female riders of all ages and abilities. If you can ride a bicycle without training wheels you can race. If your a mom or dad you can race too! Come check out our fast paced, adrenaline filled sport. 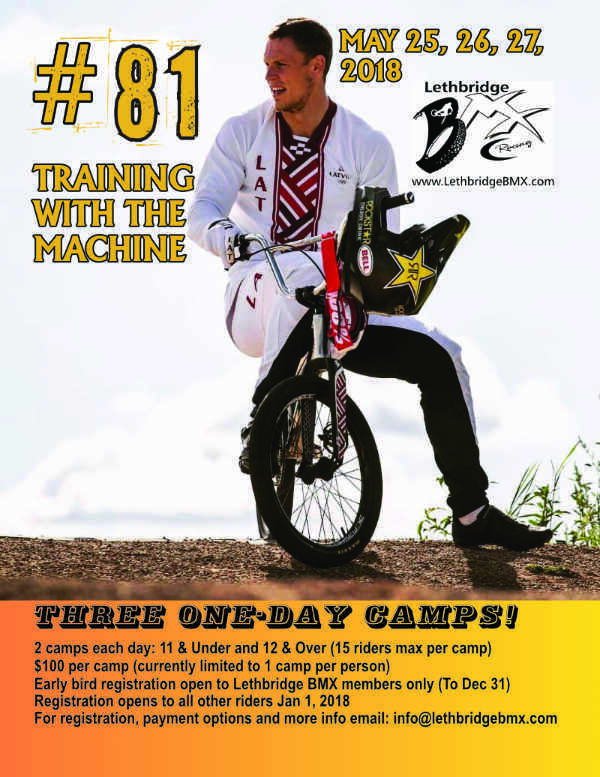 Established in 1979, Lethbridge was one of the first BMX racing clubs in Canada. We are a non-profit society with a board of directors all on a volunteer basis. The club has had several temporary locations starting in the coulees, to the river-bottom, next to Marshalls Auto Wreckers, in what is now a parking lot to the north of the Ability Resource Centre, and finally to it's new permament home in 1986 where it remains to this day. Looking to register for Provincial Races?